The elderly are more prone to proximal humerus fractures from accidents such as falling on an outstretched arm. They may also occur in young people involved in high-energy accidents. Sedation or general anesthesia are administered. An incision is made through the anterior and middle heads of the deltoid (shoulder) muscles. The axillary nerve is identified and protected, and the rotator cuff and proximal humerus are exposed. The fracture margins are trimmed and prepared, and the fracture bed is washed. 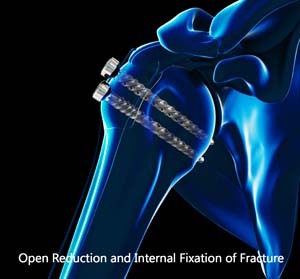 Stay sutures are placed in the tendons of the rotator cuff muscles to gain control of the fracture fragments. Then your surgeon brings the fractured fragments into the correct anatomic alignment by manipulation and pulling on the stay sutures. K-wires are used to temporarily secure the fracture fragments. Once the bones are aligned, strong sutures, screws, or a system of plate and screws are used to hold the bone fragments together. Imaging tests are performed in different angles to verify the correct alignment of the fragments and position of the plate and screws, and to assess range of motion. Following surgery, there is a minimum period of immobilization after which rehabilitation should begin. As early as the first post-operative day, you will be made to move your arm as much as you can without too much pain. Physical therapy starts with passive/assisted range of motion exercises. Activities of daily living can slowly be introduced but there must be no lifting or shoulder movements against resistance for at least 6 weeks. Strengthening and stretching should then begin gradually with resistance exercises. It is necessary to monitor progress in movement and strength as persistent weakness may indicate a rotator cuff tear or nerve damage.